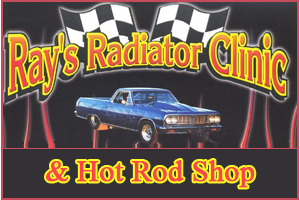 Ray's Radiator Clinic, Inc., builds custom radiators for street hot rods at our location in Sterling Heights, Michigan. We know automotive heating and cooling systems inside and out, and we can build the custom aluminum or copper-brass radiator that you need to complete your project. You can also order custom electric fans and shrouds, or have car parts media blasted and powder coated for a great finish. 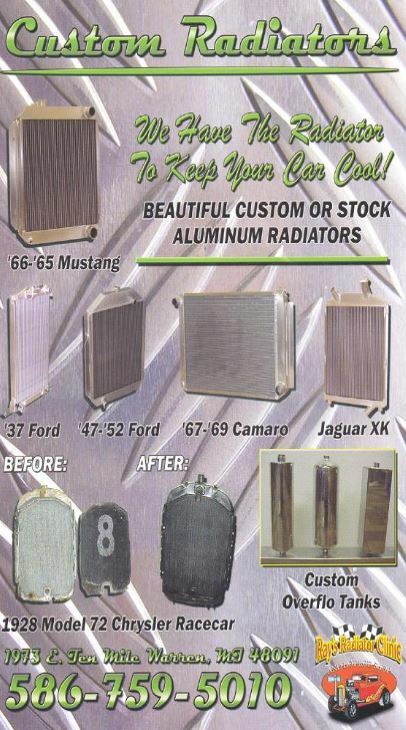 We have the right radiator to keep your car cool. Order a beautifully made custom radiator or a stock aluminum radiator, with or without a shroud or fan. We polish radiators too. Contact us for specialty engine fans, radiator fans, and air conditioner fans, any year, make, or model. We get it looking great and working right. Our staff can design and build a custom fan shroud to achieve the particular look you're after. From high polish to a matte black finish, with single or dual fans, we do it all and we do it right. Are you looking to replace your old gas tank or improve on a tiny fuel cell? We can build you a new one. For relining damaged gas tanks, we offer Gas Tank Renu-USA® to get you back on the road. We also recore hard-to-find, hard-to-replace heater cores, including double-core Chrysler™ models. Enjoy the convenience of our two custom-made media blasting booths. You can media blast your entire car or just the parts you want to restore. Media choices include crushed walnut, glass bead, aluminum oxide, and plastic media. 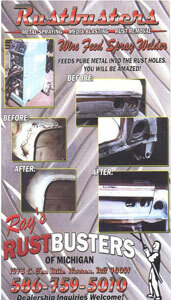 We offer metal spraying in addition to media blasting for rust removal. Our wire-feed spray welder feeds pure metal into the rust holes. You will be amazed by the results! Our in-house powder coating booth handles all the powder coating you might need done, big or small. Get baked-on protection and high style in your choice of colors.